A student from the University of Utah has made headlines by creating a multi-purpose backpacking tool called the SPARtool. Though it’s not available yet, once you hear about it, you’re going to want to get on it as soon as possible. It’s no doubt that being in Utah alone is enough to inspire somebody to get outdoors. With countless national parks, including Canyonlands, Bryce Canyon, and Grand-Staircase Escalante, locals and visitors to Utah alike find themselves outdoors more often than not. Stewart Yeoh is no exception. Yeoh has always loved fishing and camping, and his desire to be outdoors certainly didn’t stop as he got older. Two years ago, Yeoh stated that he was going to put together a kit to aid him on the trail. After his own experiences being outdoors, he figured out that there wasn’t really a tool out there that could do everything, that didn’t weigh under five or six pounds. Every backpacker out there can understand that the need to have a multi-purpose tool is just as important as having your backpack be lightweight. Yeoh wanted to come up with a solution that could serve backpackers everywhere that were feeling the same way. After stepping up to the plate in 2014, he’s finally created his outdoor masterpiece; the SPARtool. Though there are some pretty good tools on the market right now, like the VSSL Supplies Survival Kit, you can be guaranteed that Yeoh’s tool is just as practical, especially for unpredictable situations. After all, Yeoh is working towards his Ph.D in bio-engineering and mechanical engineering, so at least you can be sure that he knows what he’s doing when it comes to designing things. Not only that, for those backpackers out there who prefer to invest in things that were made with a little more love, than the SPARtool is right for you. Yeoh hopes the SPARtool will be an essential tool for people who come to Utah; a very “outdoorsy state”, as he told KSL.com. The SPARtool is just about ready for the backpacking world, but is the backpacking world ready for the SPARtool? This 22-inch by 6-inch tool is one of the most advanced of its time, having everything you could possibly need without any hassle. It includes a shovel, blade, saw, bottle opener, pick, hammer, pry bar, and a handle and sheath that’s ideal for comfort and compactness. It might seem like a lot to include all in one tool, but this thing only weighs 2 lbs, 15 oz. Unlike other survival kits that can help you last if you get into a terrible situation on the trail, the SPARtool really helps you to get out of one. The SPARtool would come in handy if you needed to dig, cut branches, cut wood, break earth and rocks, hammer in your tent, pull out nails, chisel ice, and many other things-like opening a drink. 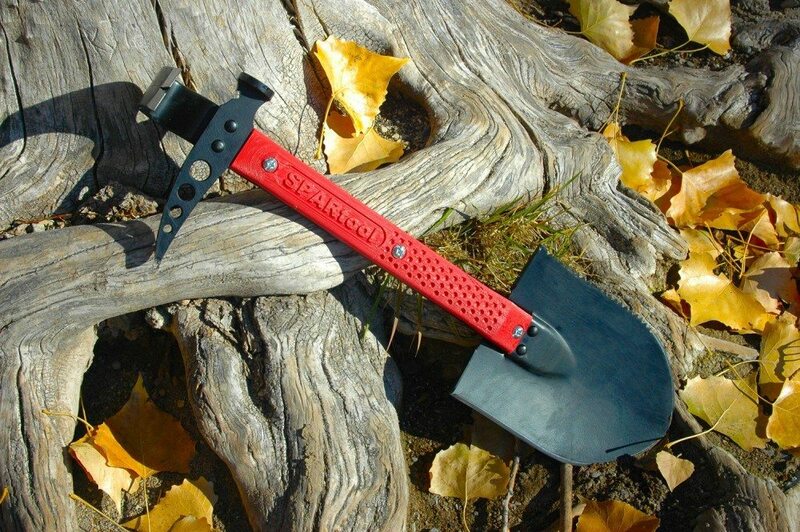 You’ll notice that the SPARtool, unlike other tools, has a shovel head that’s not collapsible. You might wonder why a product whose goal is to be more compact doesn’t have this feature. However, Yeoh has found in his experience that any shovel head that can collapse will eventually become loose on the hinges, making it very difficult for it to do its job. According to Yeoh’s story, it’s quite clear that he wasn’t able to build his invention overnight. It took a lot of time and trial and error, and the SPARtool has still not seen its last stage of production. Although Yeoh has tried the tool himself and he has been quite satisfied, he still thinks that it can be made using different materials like carbon fiber and titanium to make it even lighter than it is now. Yeoh was able to raise funds for building the SPARtool by creating a Kickstarter campaign, raising $20,000. Though he already has a website to advertise his product, you’ll have to wait until spring to have the SPARtool in your hands. According to the site, the SPARtool will be available March 2016, and will cost $140. However, Yeoh and his partner Joel Parks aren’t sure about that just yet. Eventually, you’ll be able to find this 7-in-1 product on Amazon and eBay, in addition to the SPARtool website. It’s not everyday that your average backpacker creates something revolutionary for his or her beloved hobby. There are a lot of entrepreneurs out there that have used their own experience to create something that they feel will really make a difference in the lives of others who share similar interests. While we don’t know quite yet what impact the SPARtool will have on outdoor survival, it’s great to see inspired individuals put their ideas to work. Hopefully others will feel motivated to do the same. There’s a lot of new gear coming out in 2016, but the SPARtool may not be getting as much attention as other mainstream products out there. Make sure to spread the word!